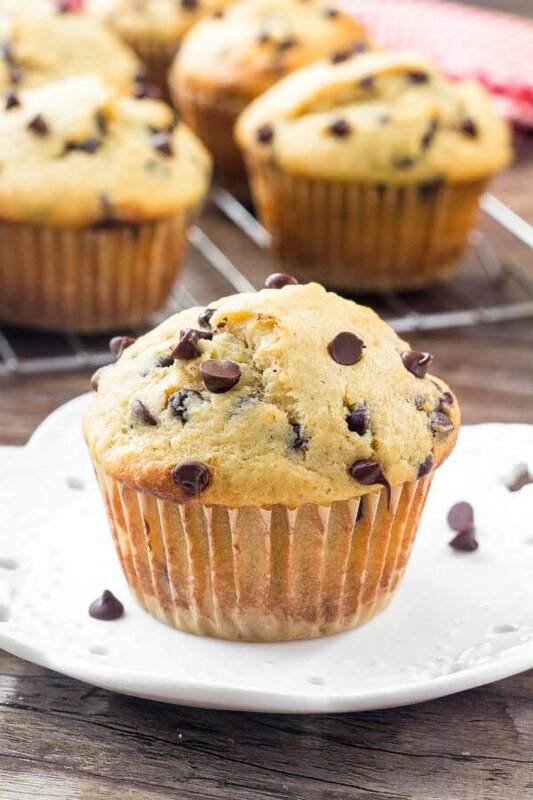 These Banana Chocolate Chip Muffins are moist, fluffy, buttery and filled with chocolate chips. They taste like a warm slice of banana bread; have perfectly domed, golden muffin tops; and have just the right amount of chocolate chips. 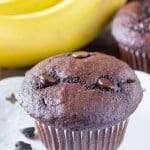 These banana chocolate chip muffins just might be the perfect recipe (if I’m allowed to say so myself). 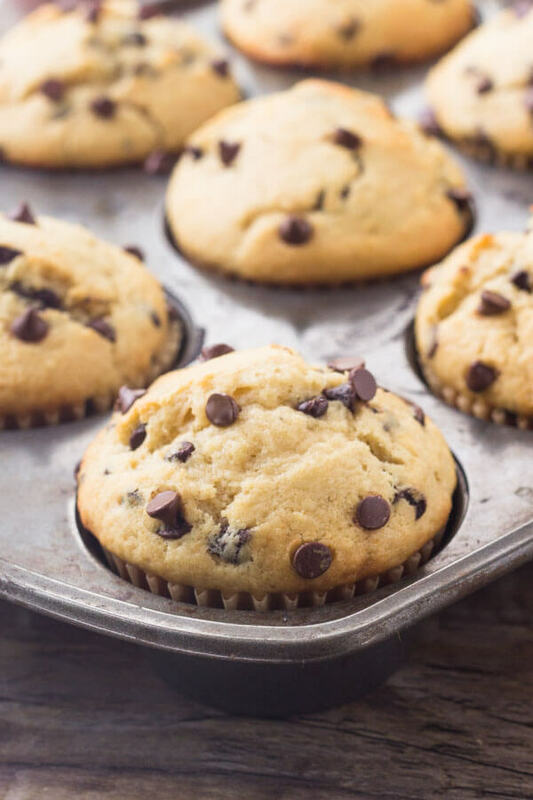 These are soft, super moist, filled with delicious banana bread flavors – but in fluffy muffin form and filled with chocolate chips. They feel rustic and homey, and they leave your kitchen smelling seriously divine. 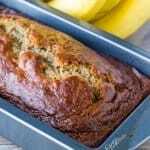 This recipe is actually thanks to a dear friend who messaged me a few days ago asking about making my Banana Bread. She ended up baking hers into muffins (genius) – making me realize I needed a true banana muffin recipe on Just So Tasty. So here goes. 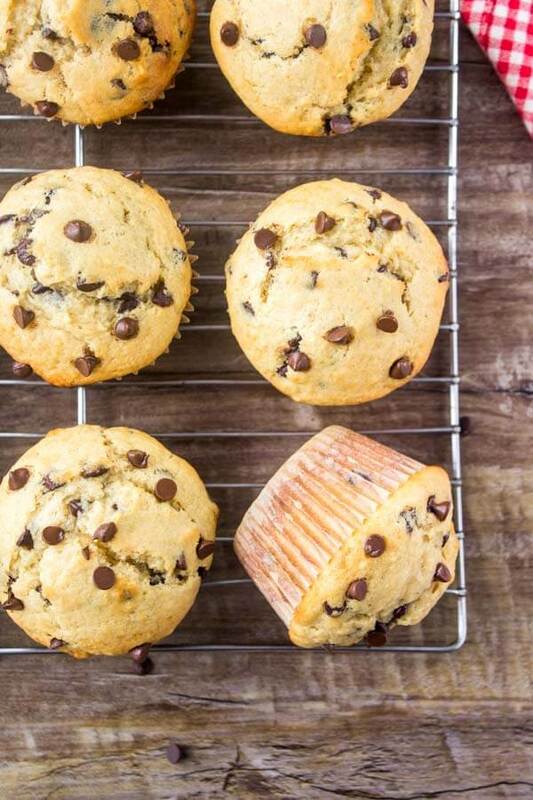 You’re going to love the flavor of these muffins first and foremost. 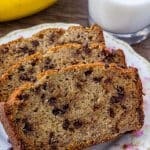 They have the perfect banana bread taste that’s sweet, mellow and deliciously banana-y. The banana is complemented by lots of vanilla and brown sugar for even more flavor. 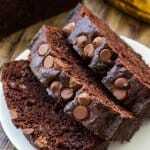 And last but not least – there’s tons of chocolate chips in every bite. Melty chocolate chips and bananas are so delicious together – but if you’re feeling overzealous you could also add 1/2 cup chopped walnuts for that salty & sweet combo. 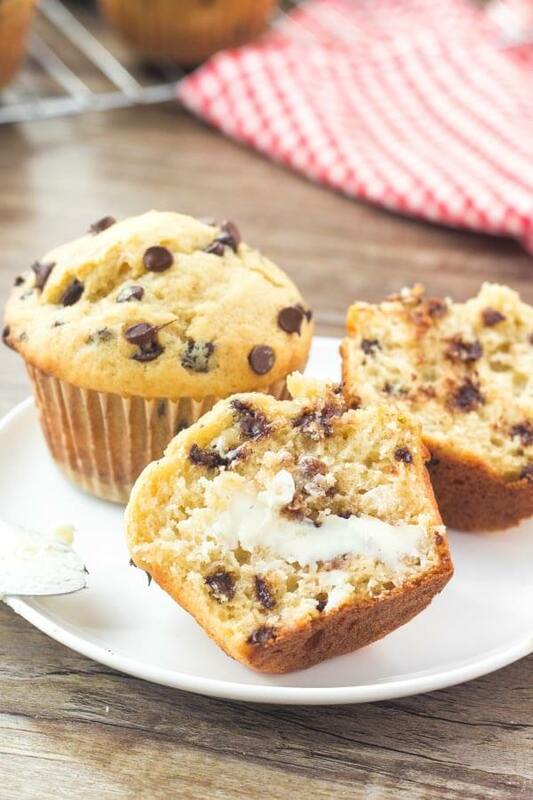 (PS we’re using butter because buttery, fluffy, muffin deliciousness is…. well buttery delicious). To get started you’ll first whisk together melted butter and sugar, followed by the eggs and vanilla. Then stir milk, followed by the mashed bananas. After sifting together your dry ingredients, you’ll VERY gently fold the dry ingredients into your banana mixture using a large wooden spoon or spatula. The batter will be very thick. With muffins, it’s 100% imperative to be very careful not to over mix once you combine your dry & wet ingredients. I know I sound bossy here – but muffin batter should be mixed until only just combined. Otherwise, your muffins become tough instead of tasty 🙁 🙁 Having the melted butter, eggs, and milk at room temperature before getting started helps. I also recommend using buttermilk for your muffins because it creates the softest, moistest muffin crumb without weighing them down. I know buying buttermilk is rather… annoying. But I keep coming back to it in recipes because it really & truly leads to the best texture. I promise. But if you’re in a pinch, you can make your own homemade version using vinegar and milk (see the recipe notes). A way shorter baking time than making banana bread. 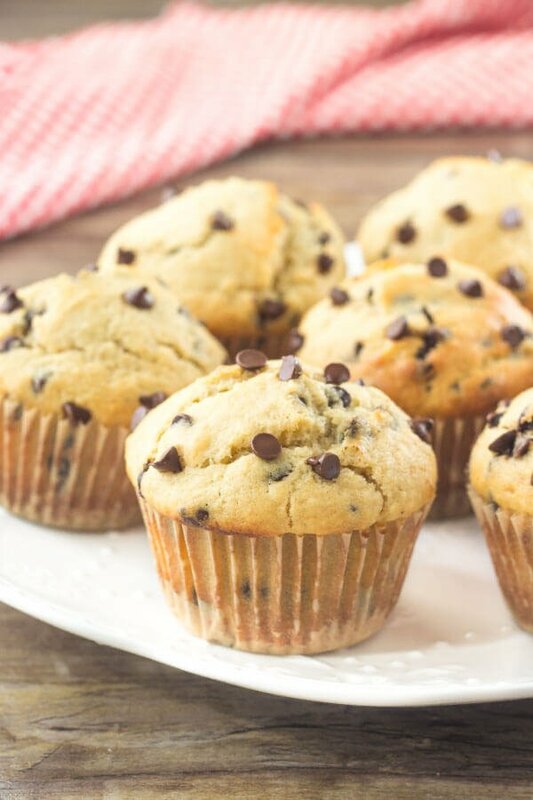 These Banana Chocolate Chip Muffins are moist, fluffy, buttery and filled with chocolate chips. 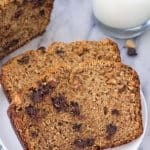 They taste like a warm slice of banana bread and have perfectly domed, golden muffin tops. Preheat the oven to 375F. Line a muffin tin with muffin papers. You'll end up with 12-14 muffins total. In a second large bowl whisk together the melted butter, sugar, eggs, and vanilla. Then gently fold in the mashed bananas. Gently fold about 1/2 of the flour mixture into the wet ingredients, followed by about 1/2 of the milk. Repeat with the rest of the flour mixture and milk. Be careful not to over mix. Spoon the muffin batter into your prepared muffin pan until each cavity is filled to the top. Optionally sprinkle a few chocolate chips on top of each muffin. Bake for 16-20 minutes, or until an inserted toothpick comes out clean (except for melted chocolate). Allow to cool for 5 minutes in the muffin pan, then remove from the pan and continue cooling on a wire rack for 5-10 minutes before eating. *Or feel free to use a combination of white sugar and brown sugar. 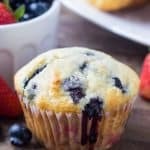 Great taste and because they are muffins you can have them for breakfast! I thought your Banana Bread Muffins were fantastic, but I think these may be even better, if that is possible. I love when a recipe comes out looking and tasting exactly as described. The domed tops were perfect. And they are incredibly moist and fluffy. Out of all the bloggers I follow, you simply have the BEST muffin recipes of all. Thanks for another winner. The Recipe Rating option did not appear when I typed my comment. I need to give this 5 stars, so here goes! Thank you so much Vicki! I’m so glad that you love the muffins and that they turned out moist & fluffy for you! Sooooo yummy! Easy to make and they were delicious. A little crispy on the outside and gooey in the inside. Perfect! Definately saving this, thank you! !